Cysters from marginalised communities can often feel isolated and alone. At these informal meet-ups, Cysters can share information, talk about their experiences and support one other in a space where they belong. These sessions also promote self-care and listening skills. 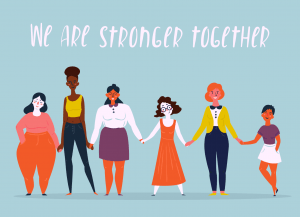 Cysters affected by reproductive health issue receive emotional support and are shown ways they can care for themselves through this peer network. We work within the community to raise awareness, share information and to engage with religious and community leaders, many of whom are men to break down barriers related to reproductive health. Our research is carried out in response to issues reported by our Cysters, this involves the community and is aimed at developing sustainable and effective intervention to assist the NHS and Public Health England. Public Health England have reported that in recent years the uptake of cervical screening has dropped considerably. Cysters have decided to take action and help increase this by working within the community to dispel the myths around cervical screening. We will be holding culturally sensitive and age appropriate drop in clinics with our trained nurses within community centres and places of worship. We are working to help reduce period poverty in Birmingham by collecting for Sanitary items and using these donations to give to those living under poverty line. Alone we cannot create change, however a Cysterhood can. Help us create a Reproductive Revolution and get involved.